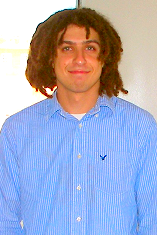 Congratulations to Jamie Meeroff, Aerospace Engineering Ph.D. student, for receiving the National Science Foundation's Louis Stokes Alliance for Minority Participation (LSAMP) Bridge to the Doctorate Fellowship for the 2006-2007 and 2007-2008 academic year. Meerof's research interests involve boundary layer transitions in hypersonics. His faculty advisor is Dr. Mark J. Lewis.